This book shows you how to advertise and sell your products or services on the Web. Learn the basics of online selling and some of the challenges facing online merchants. Learn about the importance of selecting a suitable domain name and what's involved with Web hosting. Take a look at Web authoring software and inexpensive software which you can use to establish your own e-commerce Web site. Most of these are easy-to-use solutions which don’t require any programming knowledge and can get you up and running in no time. Make your site user-friendly and fine-tune it for e-commerce. Learn how to keep the name of your business in front of your customers with permission-based e-mail and e-newsletters. Find out the significance of viral marketing and the importance of referrals and affiliate programs. Take a look at the challenges of integrating your back office and accounting systems with your e-commerce software. Review some of the taxation issues relating to e-commerce. Look at ways to use traditional marketing to drive traffic to your site. Find out how to use the Web for your market research and how to prepare your Web marketing plan. Then, take a look into the future and new marketing strategies using Internet telephony, streaming audio and video. Find out why e-commerce will be so important for the survival of your business in the years to come. The Fundamentals of Effective Online Selling will help you expand your business. It will provide you with all the information you need to start increasing your sales. Chapter 1 - Global Reach–Sell to the World! Chapter 3 - What do We Mean by Web Marketing & E-Commerce? Chapter 4 - How Much Business is Being Done Over the Web? Chapter 9 - To Host or Not to Host? Chapter 23 - What's it Going to Cost? 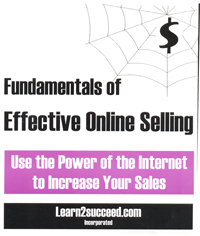 Fundamentals of Effective Online Selling: Use the Power of the Internet to Increase Your Sales by: Learn2succeed.com Incorporated 206 pages, ISBN 978-1-55270-210-9; softcover; published in 2005; $29.95.